Where does Verso stock trade? Verso's stock trades on the New York Stock Exchange under the symbol "VRS." Can Verso stock be purchased directly from the company? No. Stock cannot be purchased directly from the company but can be purchased through a broker. When did Verso become a public company? Verso's initial public stock offering took place on May 14, 2008. When will Verso's next earnings release occur? Information regarding the Company's earnings release dates and other upcoming events can be found on our Upcoming Events. All of Verso's publicly available information can be accessed on this web site. If you wish to have news releases and other information e-mailed to you, please click here. and enter the appropriate information. 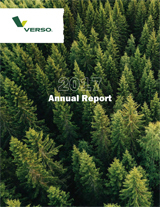 Verso's fiscal year ends on December 31. The company’s transfer agent is Computershare, 211 Quality Circle, Suite 210, College Station, TX 77845, (800) 368-5948, www.computershare.com/investor. If you are a registered shareholder, please contact the transfer agent for services such as changing your address and lost stock certificates or dividend checks; otherwise, contact your stock broker. - Do you have another question that hasn't been answered?